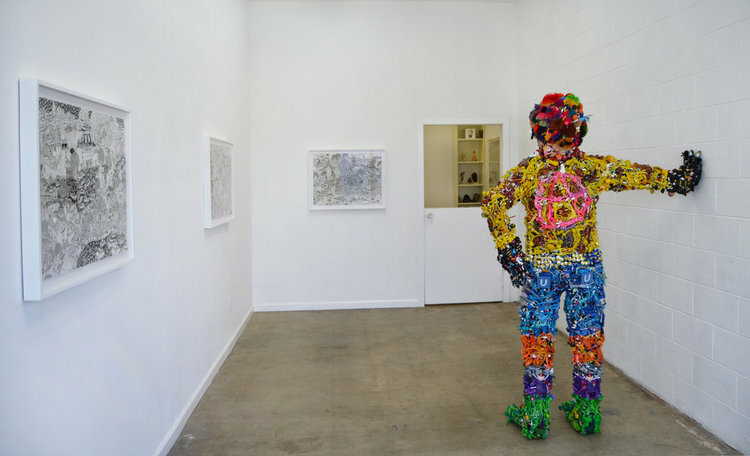 Over the past decade, artist Michael Decker has collected thousands of bendable figurines commonly known as bendies, produced for their malleable play. Although they rarely vary in their construction of pliable wire covered in rubber, the figures range from generic animals and characters of pop-culture (Gumby, Simpsons, Santa, Aliens...) to the emblemized promotional material as well as sought-after rare collectibles. 'Ben D' is a human-sized figure compiled by Decker from these differing personalities and archetypes. His composite form features a head of hair made from Kushball bendies and Gumbys for toes, a studded belt made of 'Jack In The Box' Jack hats and a leopard-print jacket with contrasting anarchist symbol. His dress seems eerily informed. Leaning languidly against the gallery wall, 'Ben D' evokes a casual, disarming poise, trying to blend in amongst a more rigid human crowd.